Remember when #23 UVA was losing four in a row and seemed to be a sinking ship heading toward an iceberg? That’s so … three days ago. Virginia held #5 North Carolina to half its season average in points in a 53-43 win Monday night before a raucous throng in the John Paul Jones Arena. The Tar Heels (25-6, 13-4 ACC) had decimated the Cavs by 24 nine days ago in Chapel Hill, holding Virginia to a season-low 41 in the rout. UVA (20-9, 10-7 ACC) returned the favor, holding UNC to 35.4 percent shooting and forcing 14 Heels turnovers. Coach Tony Bennett switched things up at the outset, going with a four-guard starting lineup that included freshmen Ty Jerome and Kyle Guy against the bigger, stronger Tar Heels, hoping to inject offense at the expense of exposing his team to Carolina in the post. Guy provided the offense, going for a game-high 17 on 6-of-11 shooting, 5-of-7 from three-point range, and the smaller Cavs held their own against UNC inside. 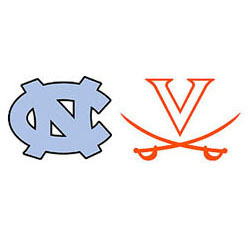 The Tar Heels ended up with a modest 38-35 advantage on the boards, but Virginia actually had a 13-10 edge on the offensive glass, and a 14-11 margin in second-chance points. That, plus an 18-5 advantage in points off turnovers – UVA turned the ball over just four times on the night – helped the ‘Hoos overcome 32.2 percent shooting from the field. North Carolina jumped out to an early 7-0 lead, but Virginia responded with a 15-2 run to take control, and led 27-23 at the break. A Guy three pushed the margin to 10 with 17:33 to go, but Carolina would pull within one, at 40-39, on a layup by Tony Bradley at the 9:26 mark. UVA took control for good with an 11-2 run fueled by a trio of threes by London Perrantes, the third of which, at the 3:16 mark, pushed the margin back out to 10, at 51-41. Perrantes finished with 13 points and four assists. Devon Hall added 11 points and had a team-best five assists in 33 minutes. Guy, though, was the story. In addition to the scoring outburst, the freshman had six rebounds, four assists and didn’t log a turnover in 32 minutes. Joel Berry II was the only Carolina player in double figures, with 12 points. Justin Jackson, who had 20 in the Heels’ 65-41 win over UVA on Feb. 18, had seven on 3-of-10 shooting from the field.